The original NS-10M was intended for use as a hi-fi “bookshelf” speaker in homes. It became a popular nearfield studio monitor in the 1980’s, after it was adopted by the famous engineer, Bob Clearmountain. The sheet formed, straight sided white cone (as opposed to a molded or pressed cone), which is aesthetically pleasing, instantly recognizable/iconic, as well as technically advantageous. Very fast response time (the time it takes to make a sound from an electronic signal), aided by the light weight bass/mid cone and the sealed box design. Translates well – tracks mixed on them sound good on many other types of consumer speakers. Industry standard – because these speakers are in almost every studio on the planet, engineers and producers can go from one studio to the next and know how the monitors work. 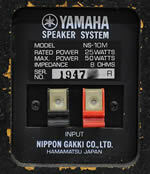 Harsh high end – this lead some engineers in 1980’s to place tissue paper in front of the tweeter. Lack of frequency response at the low end, particularly when poorly positioned and powered. Susciptible tweeters – some users have said that the original tweeters can blow out when incorrectly powered. Yamaha finally got them right, then stopped making them. The harsh high end was dealt with in subsequent models (PRO, STUDIO, MC, MX). The 1987 models also extended the low end to 60Hz, down from 85Hz. 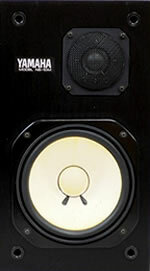 Yamaha also offered the YST-SW100 sub woofer, and later developed the NS-10MT monitor, which had a bass reflex system, down to 45Hz. However, many considered the lack of lows one of the characteristics that lead to translating mixes, and refrained from messing with it. & old terminals (wire connectors) on the back.